I’ve been deep in diary research the past few weeks as I prepare a talk for MLA 2015. 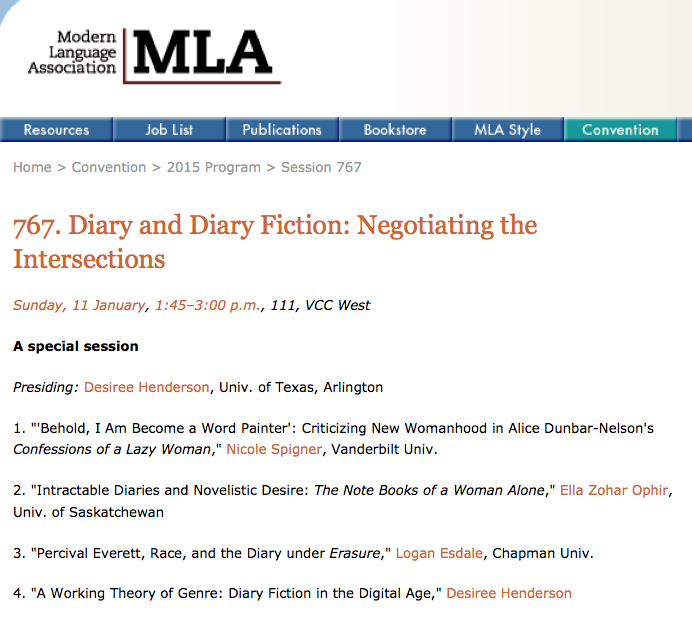 I organized a panel on diaries and diary fiction, and was gratified by the large number of excellent proposals I received. My fellow presenters represent a variety of critical approaches to the study of diary and diary fiction, as well as different national literary traditions and time periods. I cannot wait to hear their papers. Me (in my pajamas, reading the New York Times Book Review on a Sunday morning, circa 2013): Huh. There’s another review of another novel that prominently features a diary. Isn’t that strange? (Adds book title to growing list.) I wonder why so many contemporary novelists are relying on the diary? What does it mean? Maybe I could write a paper about this? One of the questions I am considering is why, although each of these novels is set in the present, none of the diary writers keeps their diaries on a computer or blog or any other digital format. While I myself am dedicated to my handwritten diary and cannot imagine typing my diary onto a screen, the common theme across the five books of eschewing available technology in favor of the old fashioned manuscript diary really interests me. I have some theories about why this is and how it impacts each novels’ representation of a diverse range of media and technologies. Something I’ve learned working on the talk: it’s very hard to discuss five novels in 15 minutes. Hopefully the audience will be understanding about my thumbnail analysis.